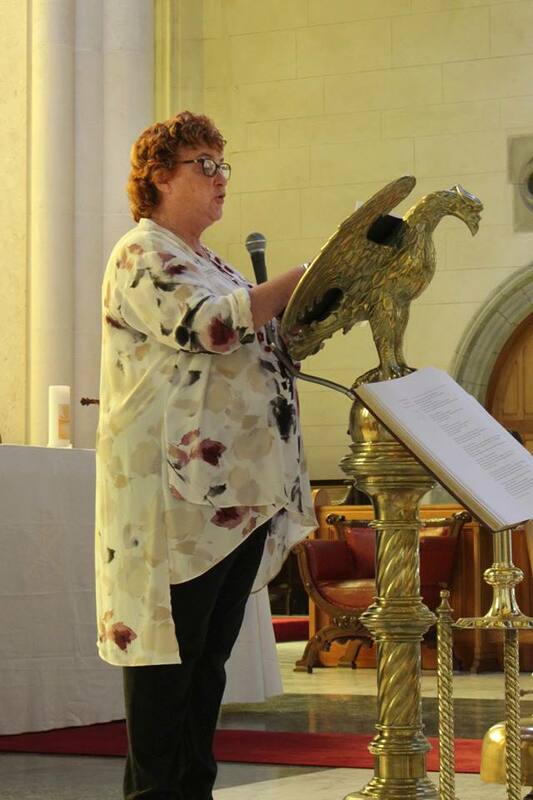 On Thursday 16th February, 2017, Community Leader, Berenice Kerr rsm, addressed the students and staff of Catholic College Bendigo at the Opening Year Mass. 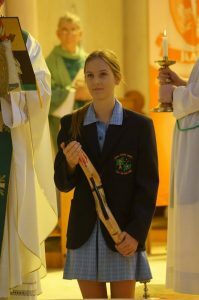 The uplifting Mass saw Berenice (pictured below) deliver an address based on the school’s theme for 2017 – ‘Living Mercy’. She spoke with inspiring words, highlighting that living Mercy is in fact not an abstract concept but something very doable and achievable in our every day lives. Catholic College Bendigo will be renamed McAuley College Bendigo in 2018 and ‘Living Mercy’ will be its new motto. 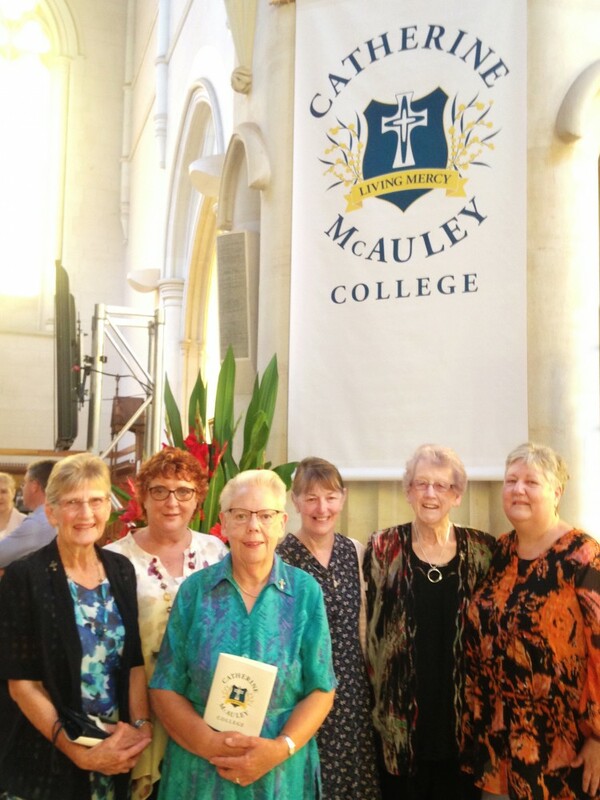 Berenice joined other Mercy Sisters at the occasion (Pictured above under the new college crest from L to R – Ellen Dunn rsm, Berenice Kerr rsm, Marie Bourke rsm, Kathy Ryan rsm, Kathleen Slattery rsm and Karon Donnellon rsm. A full transcript o f Berenice’s speech is below. My name is Berenice Kerr. I am the Leader of one of the six communities of the Institute of Sisters of Mercy of Australia and Papua New Guinea. My community extends over most of western Victoria – from Mildura to Warrnambool, from Bendigo to Edenhope. It was with great delight that I read last December of the approval by our Institute Leadership Team to change the name of Catholic College Bendigo to Catherine McAuley College Bendigo. There’s nothing wrong with ‘Catholic College’, mind you, but it’s good to recognise the long tradition of Mercy which upholds this College by acknowledging Catherine McAuley, the woman who made it all possible. Moreover, it’s good to have a flesh and blood person to look up to – a woman who loved God unreservedly, a woman who laughed and danced, who fell over and broke her arm and who became impatient when one of the sisters took all morning to paint a leaf in a manuscript. 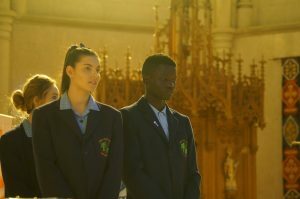 On another level, changing the name from ‘Catholic College’ removes the potential for one-upmanship with regard to another, more recent educational establishment here in Bendigo. No longer can it be argued that that particular College, by virtue of comparison, is not ‘Catholic’. So, from 2018 the College will be Catherine McAuley College and this year will be a year of transition when we move from what is good to what will be even better. This decision to change the college name was a significant one, made in a significant year. It honours 140 years of Mercy education and Mercy educators. What is more, the new crest and motto focus on the place of the College in contemporary Bendigo and explicitly announce to the city that here, in this place, mercy is lived. The crest highlights the Mercy Cross, a unique feature of the Mercy tradition. Catherine McAuley wore a Mercy Cross, not exactly the same as the one on the new college crest but sufficiently similar as to be immediately recognisable. It links the college to her and to all mercy people throughout the world. And the motto is unequivocal in proclaiming mercy. For a few moments I would like to explore at greater depth the words ‘Living Mercy’. I apologise in advance for the grammar lesson but I want to ask whether the word ‘living’ in the motto is used as a verb or as an adjective. Now, what exactly do I mean by that? If ‘living’ is a verb, it’s something people ‘do’. 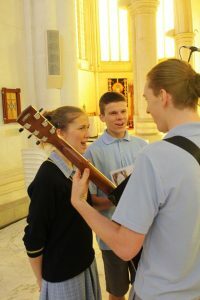 It follows that each member of the school community is expected to be actively engaged in doing just that: living mercy. Mr Turner is expected to live mercy, so are all the teachers. The school captains are expected to live mercy, as are the sports leaders, the canteen staff and everyone else in the school right down to the latest student to be enrolled. All are expected daily to live mercy. The question immediately poses itself: HOW? As a Sister of Mercy, a member of the congregation founded by Catherine McAuley, I am aware that if I want to take part in God’s mission of mercy I must allow myself to receive God’s mercy and to show that mercy by loving others. For me and for all who are baptised, the essence of living mercy is allowing ourselves to be loved by God and sharing God’s love with others. Pope Francis too has had quite a lot to say on the subject. Francis speaks of the mercy and patience of God and sums up his teaching by declaring that the face of God is mercy. Practically speaking, the Pope says, living mercy means carrying out works of mercy such as feeding the hungry, giving drink to the thirsty, making sure people have adequate clothing, welcoming the stranger, visiting the sick and imprisoned, giving good advice to those who need it, comforting those who are sad, forgiving those who hurt us, being patient, praying for others and, a new one, announced during the Jubilee Year of Mercy, protecting the environment – caring for our common home. But that’s the pope speaking; I’m a vowed religious woman speaking. Let’s explore further and ask what it means for a student of Catherine McAuley College Bendigo to live mercy. I’ll digress a little at this point and tell you a story. At this time each year one of the enjoyable aspects of my ministry as Community Leader is to attend Mass at various colleges and schools to celebrate the beginning of the school year (so now you know what I’m doing here!). Last year being the Jubilee Year of Mercy, I heard about eight addresses on what it meant to be a door of mercy in this school or in that college. While I hesitate to make comparisons and I will say right now that all of them were, in one way or another, inspirational, there was one address which blew me away. 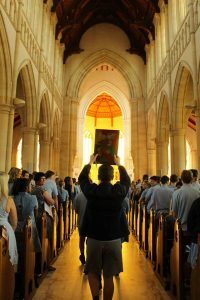 The boy captain of Trinity College Colac – his name is Jack Sherman – was outstanding in the way he explained to every student how they could live mercy in that particular school every day in hundreds of concrete ways. Unashamedly Jack challenged his fellow students to be patient, to be forgiving, to be thoughtful of others, to make sure new students felt welcome, to make their school less cold and more just, to show each other God’s face. He gave them a blueprint for living mercy each day and it was based on those works of mercy I referred to earlier. So my point is this. It can be done. Living mercy is not some abstract thing that Catherine McAuley and the group of women she gathered around her did in Dublin in the 1830s. Nor is it simply what the early sisters did here in Bendigo in the 1870s. Living mercy is do-able and achievable in Colac and in Bendigo in 2017 and as Pope Francis predicted, it will change everything. Let me now examine the second part of the question: Is ‘living’ in the motto a verb or an adjective? If ‘living’ is an adjective (or to be more precise, a present participle used adjectivally – but we won’t go into that), then it defines the way mercy is characterised at the college. What is Catherine McAuley College like? 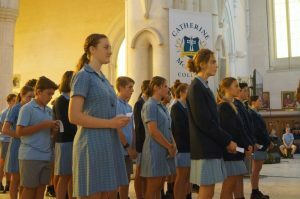 Catherine McAuley College is living mercy – that is – it is mercy breathing, mercy in the flesh. It is mercy active, incarnate, pulsating with life. What does mercy look like? See what goes on at Catherine McAuley College. You will see mercy alive, thriving, flourishing, blooming, buzzing, jumping … Do you get my drift? So now that I have had my little excursion into semantics – the working of words – where does it leave us? It’s all in where you put the emphasis. By living mercy you will become living mercy. It doesn’t matter what part of speech it is. It’s all about what you do and how you will be in your College, your family, your city, your world. Just as Jack Sherman challenged his fellow students this time last year in Colac, I challenge you, individually and collectively first of all to live mercy. Allow God to love you, forgive you, to fill you with a yearning for justice and live that mercy in your families, with your friends, your teachers, everyone you meet. And if you do? Then it all goes up a level. Catherine McAuley College Bendigo will not be simply a mercy school or even a school where mercy is lived. 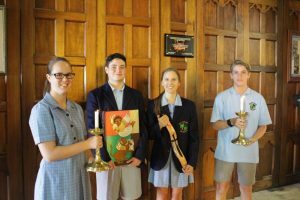 Catherine McAuley College Bendigo will be living mercy – a reflection of the face of God.